NEW DELHI: Victims of the Bhopal gas disaster, suffering deformities and illnesses, staged a hunger strike in the Indian capital Monday for increased compensation ahead of the 30th anniversary of the tragedy. 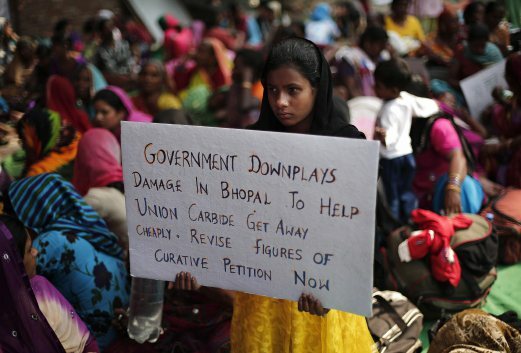 Holding signs that read “Justice for Bhopal“, about 100 mainly women and children gathered at a protest site in New Delhi, including first and second generation victims of the world’s worst industrial accident. Bhopal activist Satinath Sarangi said a handful of the protesters would fast indefinitely in the hope of attracting Prime Minister Narendra Modi’s attention to the plight of the victims of the 1984 disaster. “We have come here with the hope that the present government led by Mr Modi will correct the wrongs done by the previous government and ensure gas victims are given extra compensation,” he told the crowd.